Equi-Heart Pledge: Day 18: Why You Feel So Great on Top of a Horse! Since I haven't been able to ride due to the weather, I've been missing my horses terribly- even though they are right in the back yard! Today I asked Seren why that is and she showed me the magical transformation that happens while you sit on the back of a horse! No wonder we love to be with horses- they remind us of our unity with all that is! 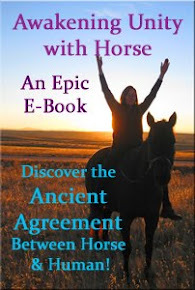 In fact, that's the message Spirit Horse Jasper shared in my first e-book, Awakening Unity with Horse- about the Ancient Agreement between Horse and Humanity- they actually agreed to help us remember that we are One with All! How cool is that?! Do you have a special memory of unity with horse or all that is that came through horses? Please share! Feel like something is standing between you and Unity with Horse? There might be! Here's one story about how I cleared what was standing between me and bliss with Charm last year! Blog post: What's Standing Between You and Unity with Horse? 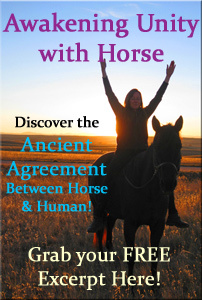 Curious to learn more about the Ancient Agreement that Horse made to help Humans remember Who They Really Are? Grab your copy of Awakening Unity with Horse. 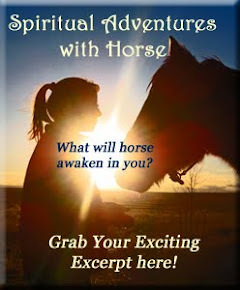 It comes with over 90 minutes of powerful guided audio exercises to help fast-forward your connection with Horse and your Spiritual Journey! Click here or the picture below to learn more about this exciting book and what industry leaders are saying about it!